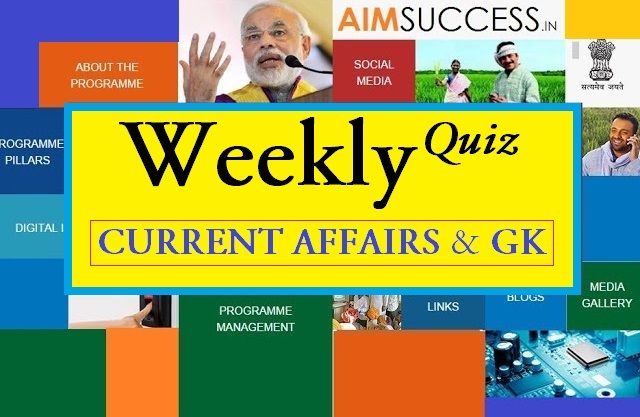 The Weekly Current Affairs Quiz (27 Nov to 03 Dec) 2017 cover topics including Director General of National Archives, Exercise ‘Ajeya Warrior- 2017’ and Indian Sports Honours among others. 1. Who is the Chairperson of 15th Finance Commission that was recently constituted by the Union Government? 2. India will provide how much financial assistance for Afghanistan’s Transport Network? 3. Who was appointed as India’s G 20 Sherpa? 4. Who was appointed as the Chairman of the National Anti-Profiteering Authority (NAA) under GST regime? 5. Who was conferred with the 3rd Indian Council for Cultural Relations (ICCR) Distinguished Indologist Award? 6. Who was appointed as the Director General of National Archives? 7. The National Skill Development Corporation has signed a three-way MoU with Tourism and Hospitality Sector Skill Council and which rental hospitality service company to boost alternate hospitality sector? 8. The City of Oxford has stripped which Nobel Peace Laureate of its human rights award for failing to respond to the world’s biggest refugee crisis? 9. Which Australian state has become the first one to legalise assisted death, euthanasia? 10. Who won the ‘Sportswoman of the Year’ award in the individual sport category at the Indian Sports Honours? 11. The 7th edition of three-day ‘Kathakar - International Storytellers Festival’ was inaugurated in which city? 12. The combined military exercise ‘Ajeya Warrior- 2017’ began in Bikaner, Rajasthan between India and which nation? 13. The Indian Sports Honour for ‘Sportsman of the Year’award in team sports category went to which player? 14. Which state’s high court has imposed a complete ban on sand mining? 15. The Pradhan Mantri Sahaj Bijli Har Ghar Yojana (SAUBHGAYA) was launched recently in which state? The 15th Finance Commission has been constituted by the Union Government under the chairmanship of NK Singh, former bureaucrat and ex-Member of Parliament. The Commission will make recommendations for the five years commencing 1 April 2020. India will provide financial assistance of USD 2.87 million to Afghanistan for the refurbishment of 350 buses to help in strengthening the public transport system of capital Kabul. The assistance would be used to procure spare parts for the Milli Bus for refurbishment of 350 previously supplied buses under Indian assistance. Former Secretary of the Department of Economic Affairs Shaktikanta Das was appointed as India's G20 Sherpa till December 2018. Sherpa is appointed for the Development Track of the G20 summit. Prior to Das, former NITI Aayog Vice-Chairman, Arvind Panagariya, held the responsibility of the G20 Sherpa. BN Sharma, the 1985 batch IAS officer of the Rajasthan cadre, was appointed as Chairman of the newly constituted National Anti-Profiteering Authority (NAA) under the Goods and Services Tax (GST) regime. Prior to this appointment, Sharma was an Additional Secretary in the Department of Revenue. Professor Hiroshi Marui of Japan was conferred with the 3rd Indian Council for Cultural Relations (ICCR) Distinguished Indologist Award -2017 by President Ram Nath Kovind, for his exemplary contribution to Indology at a function in Rashtrapati Bhavan, New Delhi. Professor Marui has spent over 40 years working on Indian philosophy and Buddhist Studies. IAS Pritam Singh was appointed as Director General of National Archives in the rank of Additional Secretary to Government of India. He was earlier working as Additional Secretary, Ministry of Corporate Affairs. The National Skill Development Corporation (NSDC) and Tourism and Hospitality Sector Skill Council (THSC) signed a tripartite Memorandum of Understanding (MoU) with Airbnb in Delhi on 28 November 2017. The MoU aims to provide hospitality skills training to hospitality micro-entrepreneurs in India. Nobel Peace laureate, Aung San Suu Kyi, has been stripped of the ‘Freedom of Oxford award’ over her inaction in the escalating Rohingya crisis. The Oxford City Council voted unanimously on 27 November 2017 to permanently revoke the ‘ Freedom of the City’ honour awarded to Suu Kyi in 1997, which she personally collected in 2012, after spending 15 years under house arrest. The state of Victoria has become the first Australian state to legalise euthanasia, assisted dying. The state Parliament voted in favour of bill after more than 100 hours of debate including two all-night sittings. The law means terminally ill patients in Australia's second-most populous state will have the right to request a lethal drug from mid-2019. 11. (a) New Delhi The 7th edition of the three-day ‘Kathakar - International Storytellers Festival’ was inaugurated by Minister of State for Home Affairs Kiren Rijiju at the Indira Gandhi National Centre for the Arts (IGNCA), New Delhi on 1 December 2017. The festival is the only oral storytelling festival in India and is a part of Ghummakkad Narain- the Travelling Literature Festival which was started under the aegis of UNESCO in 2010. The 14-day long Combined Military exercise ‘Ajeya Warrior- 2017’ between India and the UK began near Bikaner, Rajasthan on 1 December 2017. The objective of the exercise is to increase mutual cooperation and coordination between the two countries. Both armies will learn and share from each other's experiences. The Inaugural edition of the Indian Sports Honours, which was held in Mumbai, saw Ravichandran Ashwin, who recently achieved the feat of becoming the fastest bowler to reach 'Club 300' in Test cricket, grab the Sportsman of the Year award. The women's cricket team captain Mithali Raj was awarded the Sportswoman of the Year award. The Madurai Bench of the Madras High Court has banned sand mining in Tamil Nadu. Justice R Mahadevan has directed the state government to close down all sand quarries within the next six months and asked to take measures for the import of sand to meet the requirements. Pradhan Mantri Sahaj Bijli Har Ghar Yojana (SAUBHGAYA) was launched in Manipur by Union Minister of State (IC) for Power and New & Renewable Energy RK Singh. Manipur is the fastest reforming state in Power sector in the country and the Manipur Government is performing well in terms of power sector in the State.